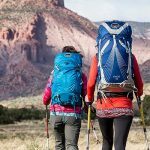 The Mountain Hardwear South Col 70 backpack is a lightweight climbing and/or expedition pack that can carry heavy loads comfortably on rugged terrain. What it lacks in some conventional features it makes up for with its waterproof main compartment and comfortable feel. The South Col 70 is much more comfortable than I expected it to be. It was comfortable with loads in the 50-55 pound range in a variety of conditions. The pack felt light and agile when climbing and felt like a much smaller pack then it actually is. The South Col 70’s lightweight hip belt does not have a lot of padding, but that did not seem to interfere with the pack’s comfort, even during long approaches or steep ascents. The hip belt wrapped well creating good fit and comfort. The hip belt also has gear loops on both sides of the belt. The hip belt does not have a pocket, which I really missed. Perhaps one gear loop and one hip belt pocket might have allowed for greater functionality. The back panel and shoulder straps on the South Col 70 have lightweight padding that is comfortable and performs well, just as in the hip belt. The back panel is straighter than other packs, but I (surprisingly) found it comfortable and it did not take any time to get used to the design. I suspect the straight back would prove warm in warmer climates due to a lack of ventilation. The South Col 70 features a large waterproof main compartment that is accessed via a top storm flap. This compartment is an old school design and does not have a sleeping bag compartment or other dividers, but it is large and will swallow a lot of gear. There is also a larger front pocket that will keep its volume no matter how much gear you stuff into the main compartment. I loved this feature, as many packs that have exterior pockets lose volume once the main compartment is filled. There is also a crampon storage pocket on the outside of the pack that is tough enough to hold crampons without damaging the pack. The lid is large and has plenty of storage, but unlike the main compartment the lid is not waterproof and since the South Col does not come with an integrated rain cover, you will have to be cognizant of what you store in the lid, in case of wet weather. The South Col 70 does not come with hip belt storage pockets and instead provides gear loops on the hip belt. It also does not come with side pockets that are typically used for 1-liter water bottles. That said, I was able to use the gear loops on the side of the pack to carry a 1-liter bottle and added a small carabineer to secure the bottle during climbing and steep ascents or descents. The South Col 70 does not come with a hydration sleeve, but a hydration sleeve will fit into the crampon bag located on the outside of the pack, if you are climbing or backpacking in an area that does not require crampons. The Mountain Hardwear South Col 70 was stable and performed well while hiking or tackling more technical ascents. The South Col did not sway, shift, or float with heavier loads and felt comfortable with loads in the 50-55 pound range. 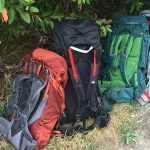 With loads above 55 pounds, I began to feel the pack in my shoulders and it became less comfortable, likely due to the lightweight frame. The South Col 70, with its waterproof main compartment, proved tough and durable after numerous trips. The zippers, pockets, and fabrics all performed well and showed no damage and the main compartment kept my contents dry, even in the rain.